Bio | Printhini Nagaratnam Real Estate | RE/MAX Hallmark First Group Realty Ltd. 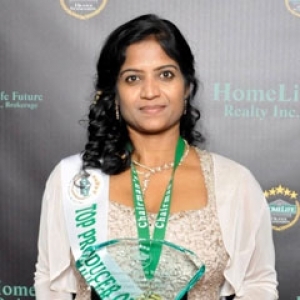 IN Durham Region, Home buyers and sellers alike have come to know Realtor Printhini Nagaratnam as “ The one to get it done” She is one of the top award winning Realtor in the Durham Region. Printhini’s first step toward “getting it done” is to listen well and to understand what buyers and sellers want and need. Then she channels her seemingly limitless energy, enthusiasm, experience and area knowledge to turning her client’s real estate goals and dreams into reality. Printhini offers in-depth knowledge of the local real estate market, as well as of the area’s schools, services, cultural and recreational activities. In addition, her enthusiasm for helping people find or sell their homes abounds whether the transaction is for $100 thousand or $10 millions . Printhini acquired her passion for homes and real estate . As a Realtor, she has seen her hobbies and passion combine to become her career. Printhini always goes out of her way to ensure that her clients are no doubt of her dedication and commitment. Her professional, friendly and honest approach, combined with her own experience of renovating and owning a wide range of newer and older properties, has given her an intimate knowledge of the working of a home and the possibilities that go beyond what is presented. Printhini ‘s clients and colleagues alike appreciate her honesty, integrity, organizational skills, and ability to negotiate win-win transactions. She is known as well for her intuition and compassion, which translate into her natural ability to put clients first, and to a dedication to giving back to her community. Printhini treats with confidence and responsibility to continue providing the same exceptional service with the majority of her business coming from repeat and referral clients. When it’s time for you to PURCHASE or SELL a home in Durham Region call on PRINTHINI NAGARATNAM – She’s “The one to GET IT DONE”.